Too many professionally produced podcasts, including such for profit ventures as CBS’ 60 Minutes podcast, don’t add art to their podcasts. 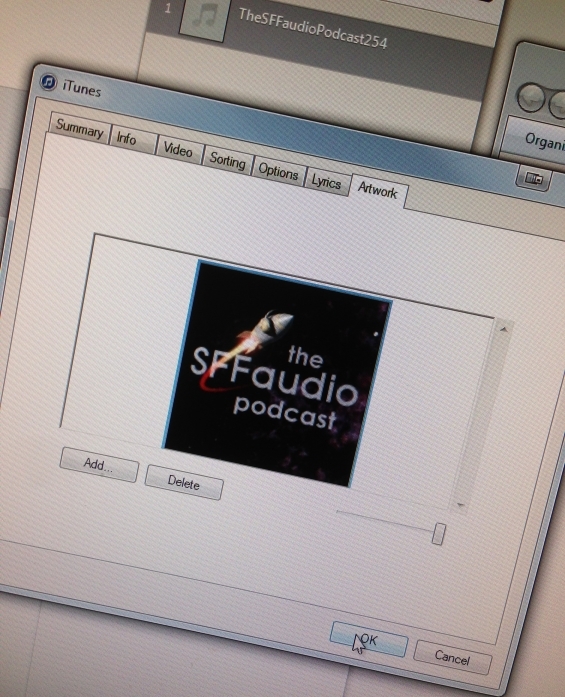 Making sure your podcast episodes have art should be the final step before you upload your MP3 to your server. You may think that because there is art on your iTunes page, or in your RSS feed, that means your podcast episodes automatically have art. 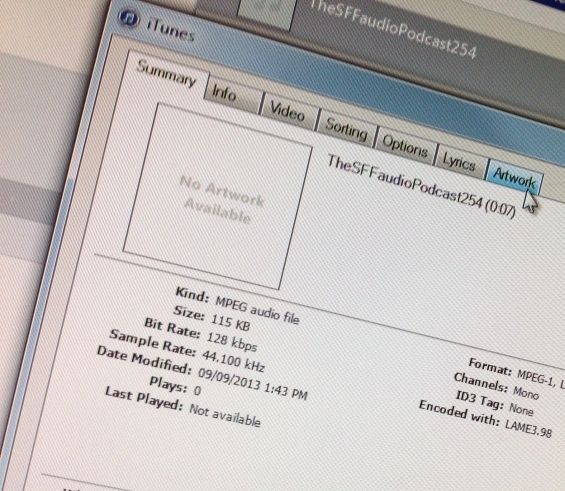 To guarantee that your podcast episodes have art you must add it the individual MP3 file’s metadata. 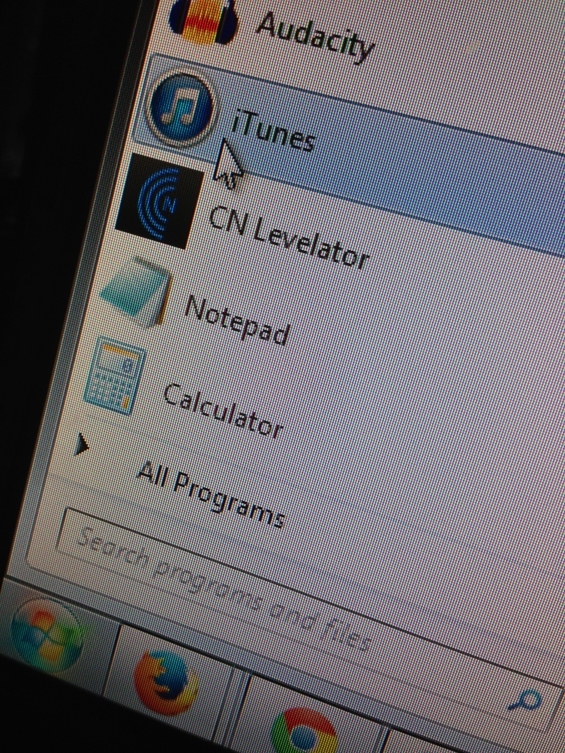 There are other programs which allow you to edit your metadata, but there is probably already a program on your computer than can do it for you pretty easily: iTunes. 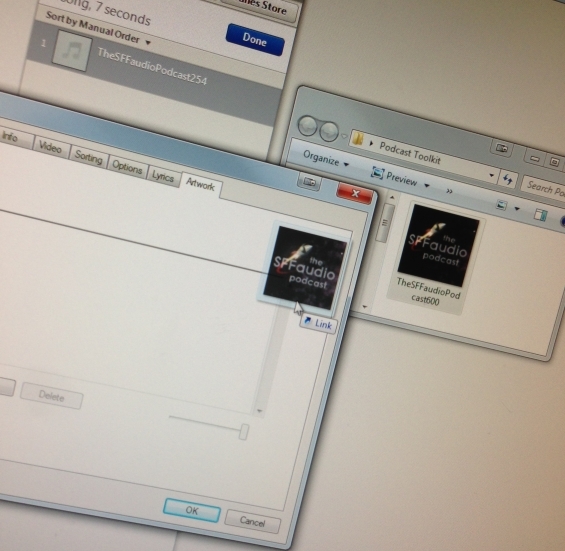 To embed art within an individual episode’s metadata using iTunes, select the episode and choose Get Info from the File menu. Click the Artwork tab. Then click Add, navigate to and select the image file, and click Choose. I found it to be a bit tricky so I’ve made a visualized step by step guide showing you how to do it. 2. 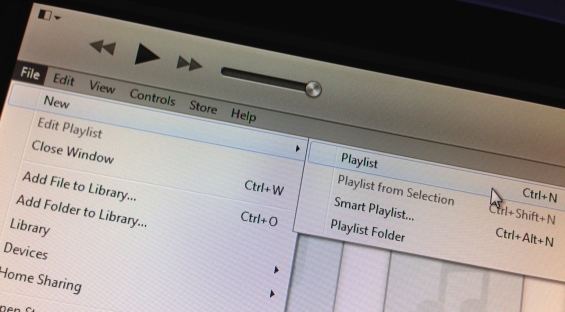 Go to File → New → Playlist (or CTRL + N) to make a new playlist. 3. 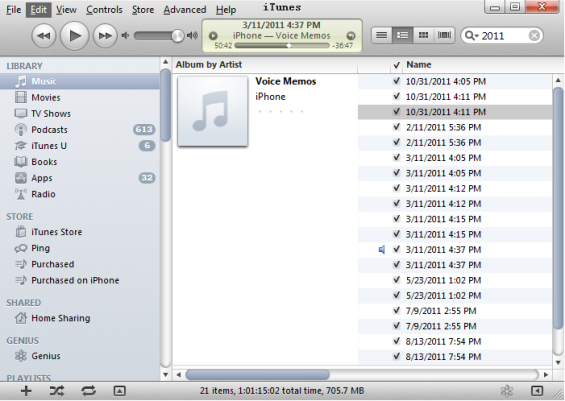 Drag the MP3 file into the now open playlist and click “DONE”. 4. 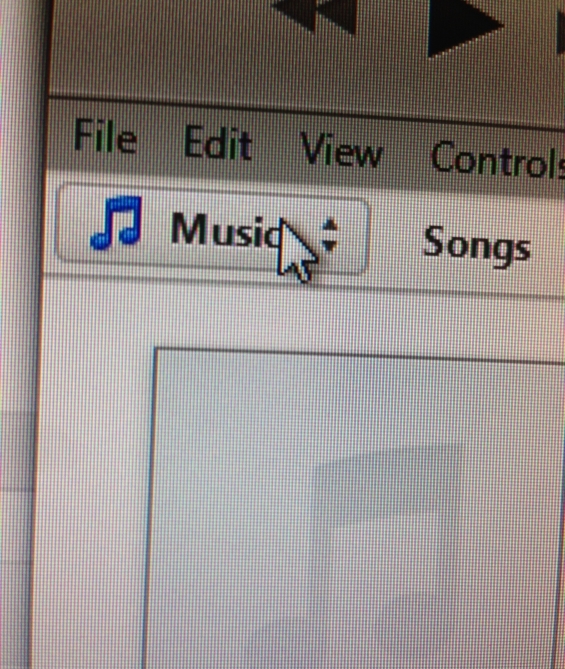 Next, navigate to “Music” (under LIBRARY). 5. 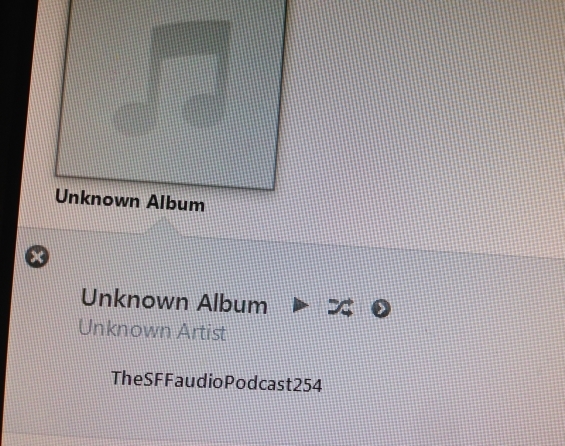 You should see a Playlist with the name “Unknown Album” and inside it your MP3. 6. 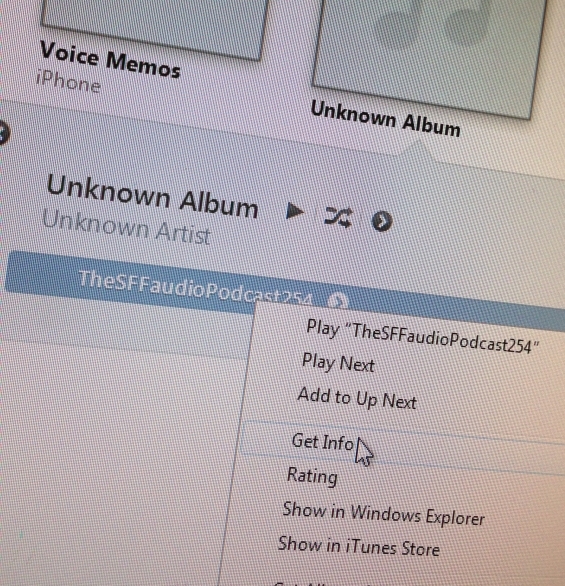 Right-click on the MP3 and select “Get info” – this will create a pop-up. 8. 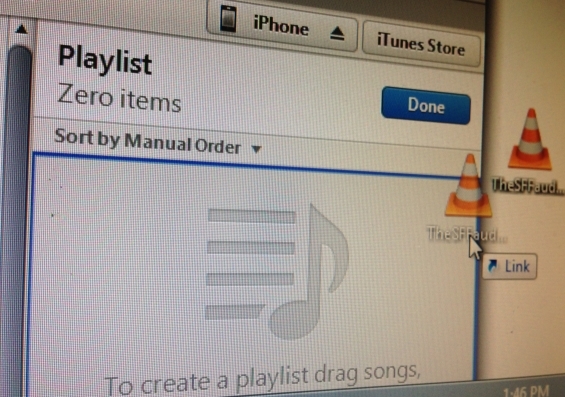 Now, select the artwork you’d like to add to the MP3 and drag it into the tab. 9. Hit “Ok.” Your art will now be linked to your MP3. 10. Repeat the process every time you make a new MP3 episode. The SFFaudio Podcast #115 – Scott and Jesse talk to Anne Frid de Vries of the Anne Is A Man blog for a talk about podcasts and podcasting. A good friend of mine pointed me to your website. I’m glad to see there are others in the world like me, who LOVE audio, and think it is a perfect medium for telling stories. I’ve been fascinated with the power of audio since I was a kid growing up in Los Angeles. I’m glad you liked “A Sound Of Thunder“. 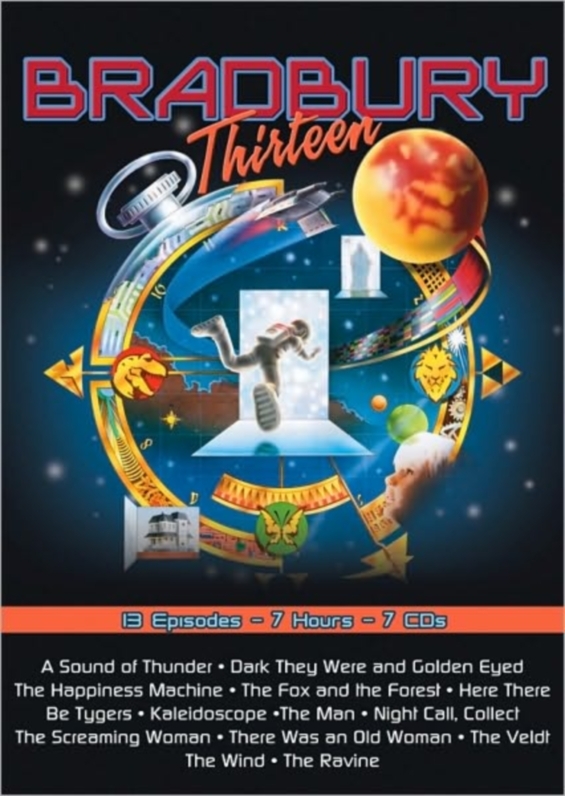 That’s one of my favorite Ray Bradbury stories, and certainly one of the most successful of the thirteen audio adaptations that I did in the series. Bradbury’s writing is so visual sometimes, it was just a natural for audio. By the way, the series is currently being broadcast on the BBC in England. Here is a link to their blog about the shows I did many years ago! The series is also lately available for download on iTunes for anyone who might be interested. Keep up the good work on your website. It seems very well-done and comprehensive. Indeed, check out the BBC Radio 4 Extra blog post that has some vintage photographs of the McDonough actually recording the programme! It makes a great compliment to Radio Drama Revival’s excellent interview with McDonough. And, of course, BBCR4X is presenting all 13 episodes weekly right now! Blackstone Audio has released the collection on CD, it is available through iTunes and Audible.com has it too! 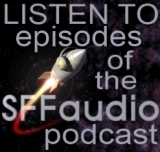 The SFFaudio Podcast #083 – Jesse talks with Jeremy Keith of HuffDuffer.com about his website. 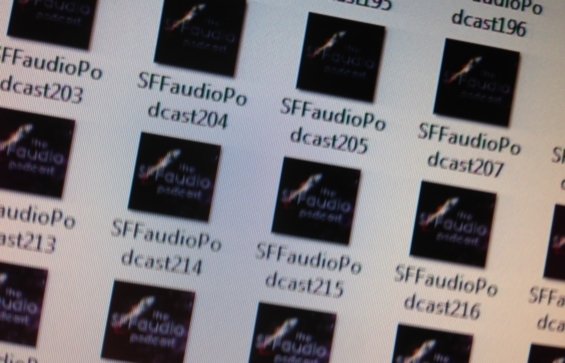 HuffDuffer can turn any MP3 file on the web into a podcast! HuffDuffer lets you make your own curated podcasts and share them with the world.